Guess he’ll have to grow into it. As a sidenote, this may have been the only car seat for sale in all of Mahasarakham. Since it was the last one in the only store that we know sells car seats, perhaps there is literally nowhere to buy them here anymore. It was about $90 and has genuine-looking European safety certification markings on it. He has more hair than you did. What a cute little squirt! 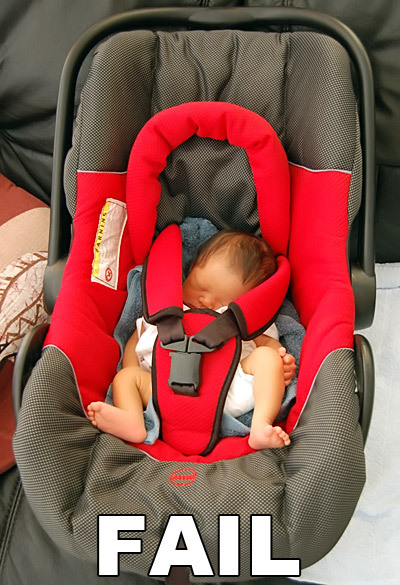 Congrats on the car seat and be careful of accidentally touching hot metal parts against his skin….the inside of the car gets really warm out there in sunny, tropical Thailand! Next PostNext I CAN HAS PICNIC?